Lucy's Cards: Here I am! I am so grateful to my incredible hostess for making me feel so welcome. Thank you BOTH for making my summer so perfect. Anyway - I thought I should share a card. Here's one to celebrate the end of the summer... it's back to school for me tomorrow. Look - no stamping! I love all of these products. THESE alphas, THESE stickers, THIS paper and THESE journaling cards... YUM YUM YUM YUM! And of course THIS twine... my fave. So I hope you all had as good a week as me. Oh I really love this....how bright and festive with the glittery letters. Thanks for sharing this inspiring card! So glad that you are back home safely! Stamping friends are the BEST, aren't they? ;) Love the glitter in this card and the design is FABULOUS! Welcome home, Lucy!!! I'm so glad you had a wonderful time, I was thinking of you the day you flew out! Such a super card love the sparkles and the font of those alphas! I'm back on Monday - are you back with students tomrrow?! Welcome back, Lucy! Glad to hear that you had a good trip. What a sweet card - love the colors, they make me happy! Take care, have a great day at school - we'll be thinking of you! welcome home!! so glad to hear that you had a great time!! LOVE your delightful card! so cute! Welcome home, Lucy! So glad to hear you had such a wonderful time, I bet it passed in a flash. YOu are back at school already (do you go back before the students?). Love your card, the letters are amazing! Welcome home, Lucy! I can imagine what a fun slumber party you had! Love your cheery card! Glad you had such a great trip! Such a fun, happy card! Super, duper cute. I love the bunting and pinwheel. I just bought a set of these stickers a few days ago and am anxious to post my little project. 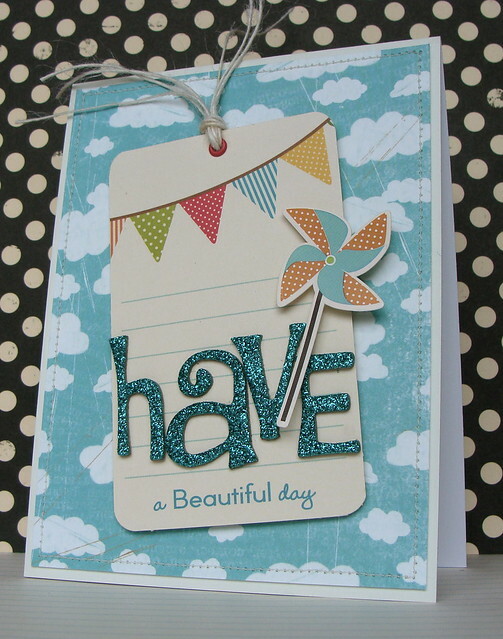 You really made this a fun card and sometimes a 'no stamping' is a fun thing! LOVE LOVE this card! Those glitter letters are YUM!